BRIDGETOWN, Barbados: amaican farmers will be getting a £16.7 million boost to help increase productivity and gain greater market access. This was made possible through a grant from the United Kingdom’s Department for International Development (DFID) under the UK Caribbean Infrastructure Partnership Fund (UKCIF), which is administered by the Caribbean Development Bank (CDB). CONGRATS: Permanent Secretary in the Ministry of Industry, Commerce, Agriculture and Fisheries, Dermon Spence (left) wishes Ambassador Designate to the Republic of Trinidad and Tobago, His Excellency Arthur Williams a good tour of duty during a courtesy call held at the Ministry’s Hope Gardens offices on April 8. Williams, who recently concluded his assignment as Jamaica’s representative to the Inter-American Development Bank, will succeed David Prendergast whose tour of duty ended in January.Williams is expected to assume duties in April. Jamaica must promote efficient use of land resources “The Nation that destroys its soil destroys itself,” Franklin D. Roosevelt, US president, once observed. It is estimated that some 75 per cent of the farmers engaged on those lands, occupy plots of less than one acre. Undoubtedly, such acreage cannot foster efficient amaica as a nation has always struggled to manage its land resources to the extent that parcels of production on the scale required. The government land that were devoted primarily to agricultural pro- should therefore deliberately and consciously production are being shifted to housing and other in- mote larger farms and businesses while introducing appropriate technologies to the existing small farmfrastructural developments. Some 379,140 hectares, or 63 per cent, of the is- ers to boost their productivity. Conversely, while we need enhanced food proland’s farmlands, have disappeared over the past 50 duction, we also need proper shelter years, according to the latest Agriculand housing. ture Census, published by the StatisAs an island with minimal land tical Institute of Jamaica in 2007. Our space, housing and other infrastrucfarms are disappearing at 9,722 tural developments are always comhectares per annum. peting for limited resources. For At the current average annual far too long, Jamaicans are aggreslosses, economists at The Agricultursively seeking affordable housing soalist have projected the decline to be lutions with the demand estimated at just over 220,000 hectares at the end over 18,000 annually. of 2019. Nevertheless, we are expressing It should be noted that in 1968, grave concerns about lands owned by farmlands accounted for an estimated 602,666 hectares of Jamaica’s total PATRICK MAITLAND both the private sector and the govland space of 1,101,000 hectares. Publisher - The Agriculturalist ernment that are being expeditiously However, it plunged to 325,810 patrick@theagriculturalist.com converted from prime agricultural lands to residential areas. hectares, or 46 per cent, as recorded However, something is systemically wrong with by the outdated Agriculture Census of 2007. Farmers are therefore anxious that Jamaica may the management of our land resources! Despite continuous shifting of a large acreage of find it difficult to meet local food demands as the island continues to squander large acreage of prime arable land into housing, the island’s housing solutions are woefully adequate. agricultural lands. The reality is that we need lands to build houses Things are not looking good for Jamaica’s food as much as we need lands to do farming. security. However, the lack of transparency and mistrust of On the one hand, we are losing the most fertile soils, while on the other side the island’s food im- the system is creating confusion. The Agricultural Land Management Division ports expenditures are climbing at a rapid rate and (ALMD), Ministry of Industry, Commerce, Agrishould reach the US$1 billion mark by 2020. The government and agricultural stakeholders culture and Fisheries, which “aims to establish a dymust energetically address the startling reality that namic land market that promotes efficient use of Jamaican farmers cannot compete with imported land resources,” should play a more active role in agricultural products while they continue to work managing such priceless natural resources. small acreages of poor-quality farmlands. Agri Life Foundation Ltd The opinions expressed in this newspaper, except for the above, do not necessarily reflect the views of The Agriculturalist and its publishers. 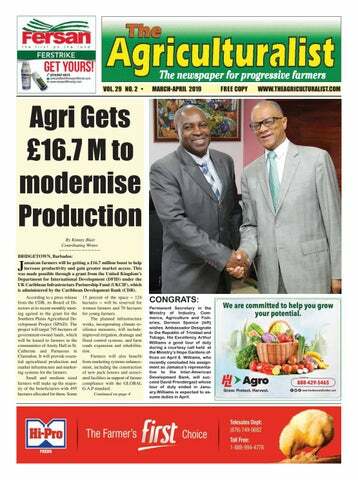 Please send your comments or suggestions to editor@theagriculturalist.com. Responses should be no longer than 400 words. Not all articles will be published. JAMAICAN PEPPERS ARE A ‘HOT ITEM’ AND A COMMODITY IN GREAT DEMAND: J.C. Hutchinson (5th r), Minister without portfolio in the Ministry of Industry, Commerce, Agriculture and Fisheries, discusses hot pepper production with (l-r) Courtney Cole, Chief Technical Director, Special Projects, Lisa Myers Morgan, Principal Research Director, Dermon Spence, Acting Permanent Secretary and Carla Douglas, Senior Research Director, at the Ministry's Certification Regulations for Hot Pepper Production Seminar held at Jamaica Drip Irrigation Ltd in Kendal, Manchester, on February 26, 2019. Hot pepper is one of the priority crops being promoted by the Government for sale in both the local and export markets. to meet demands in both the local and export markets. Welcoming the training workshop, Minister Hutchinson endorsed its aim, under the theme, “Increasing the Production and Quality of Hot Pepper Seeds.” The pepper production workshop was the first of three organised as a collaborative effort between the Research and Development Division and the Plant Quarantine Division of the Ministry of Industry, Commerce, Agriculture and Fisheries to train RADA Extension Officers, Farmers and Nursery Operators regarding the certification requirements for hot pepper seed and seedling production. The training objectives are to: • Increase the capacity for high quality Scotch Bonnet pepper seed production. • Increase the production of quality declared Scotch Bonnet Seeds by 5%. • Develop a local, red, hot pepper seed production programme. • Develop the national capacity for high quality Scotch Bonnet and other hot pepper seedling production. • Implement a national technology transfer programme for hot pepper seed and seedling productio. lans are in high gear for the Food Hygiene Bureau staging of the Caribbean 8th International Conference in Food Safety and Security set for June 11-12, 2019 at Iberostar Resort, Montego Bay, Jamaica. CEO of the Food Hygiene Bureau and Conference chair Marva Hewitt said, under the theme, “Caribbean Preparedness ..Regulatory perspective,” several food safety experts from the Caribbean, India, Canada, USA, China and Europe will speak on burning issues on new technologies in agriculture, novel foods control, food hazards, export readiness and a borderless tourism culture. Specialised workshops and award of Core Professional Development (CPDs) professional certification will be issued to participants in the following training sessions- microbiology of significance, auditing HACCP systems in food premises, allergen risk assessment and food managers certification. 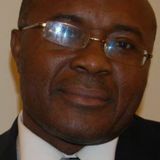 Floyd Green assigns to MICAF resources to satisfy the objecewly appointed Minister of tives of the project plans. State in the Ministry of InAs a part of an exclusive work dustry, Commerce, Agriculture agenda, Mr. Green, who was and Fisheries (MICAF), Floyd previously the State Minister in Green has been assigned to the the Ministry of Education, Industry and Commerce portfoYouth and Information, plans lio of the Ministry. to support young business This was announced by owners, prioritizing Micro, portfolio Minister, Audley Shaw, Small & Medium Enterprises as the Ministers met with direc(MSMEs) and exploring finantors of the Ministry and its agencial services, business stratecies in a planning meeting on gies and related networks February 27, 2019. available to them. State MinisGreen was officially welter Green says he will be forFloyd Green comed to the Ministry and introduced to the team by the Audley State Minister, MICAF warding critical legislations, as well as monitoring the improveShaw. ment of Jamaica’s ranking in the ease of In his opening remarks, Green highlighted his intention to fast track the pace of doing business. In addition to the agencies under the implementation of policies and initiatives under the Commerce and Industry portfolio. agricultural and fisheries as well as its inHe has committed to focusing on the vestment portfolios, MICAF has a wide speed of project execution within the min- range of agencies and divisions under the inistry, by coordinating and directing project dustry and commerce portfolio. government and people of Jamaica on it,” said Best. He also highlighted the project’s focus on creating linkages with other industries, particularly retail, processing and tourism, adding: “Aligning agriculture and tourism, another major industry in Jamaica, was also a key factor in our support for this project. As it stands right now, the demands of high value markets within the tourism and retail sectors are largely met by imports. If we equip our farmers with state-of-the-art systems, they can provide high quality, safe and nutritious products to those markets in a timely and consistent manner.” The project is consistent CDB's corporate priority of supporting agriculture and rural development and its strategic objectives of supporting inclusive and sustainable growth. It also aligned with the Sustainable Development Goals (SDG) to end poverty and zero hunger as well as SDG 5 of gender equality and SDG 8 of decent work and economic growth. Coconut Board Implementing Measures to Grow the Industry BY: LATONYA LINTON, JIS he Coconut Industry Board (CIB) will be undertaking measures in the new financial year aimed at expanding the industry. This entity is looking to acquire property at Water Valley in St. Mary or other location to establish a new seed garden, nursery and farm that will facilitate the construction of coconut water and oil factories. In addition, the organisation will set 400,000 coconut seeds with an anticipated germination rate of 50 per cent (200,000); distribute 100,000 coconut seedlings to qualified farmers; and plant at least 20 acres of coconut trees from approximately 4,000 seedlings. The information is contained in the 2019/20 Public Bodies Estimates of Revenue and Expenditure. In addition, the CIB aims to export a minimum of 60,000 seed coconuts at an estimated gross revenue of $24.57 million, up from earnings of $22.88 million from 57,500 seed coconuts in 2018. Meanwhile, the Board’s Research Department will seek to create high-yield and disease-resistant coconut palm varieties through the use of molecular techniques and tissue culture. This is in response to operational and environmental challenges facing the industry such as disease and pest infestation of the trees and nuts, unpredictable weather and natural disaster, increased price inputs, and praedial larceny. Based on the CIB’s increased operational activities the Board is projecting an operating deficit of $246.41 million as against a deficit of $129.69 million in 2018. Established under the Coconut Industry Control Act, 1945, the CIB has responsibility for promoting the interest and efficiency of the coconut industry; encouraging the production of coconuts; regulating the purchase, sale and export of coconuts; as well as the importation of coconut products and substitutes. Plant Pathologist at the Coconut Industry Board, Dr Wayne Myrie demonstrates the use of a climbing implement during a recent field day with farmers in St Mary. According to Dr Myrie he first saw the equipment in 2015 during a visit to Kochi, India. “The climbing implement could revolutionise our local coconut Industry. I bought one of the implement and brought to Jamaica. Stakeholders in the local industry have responded well to this harvesting technology,” he noted. jectory of growth and buoyancy.” However, in a series of email between the former chairman and the general manager obtained by The Agriculturalist, Henry described Elvey’s behaviour “as a show of dishonesty instead of ignorance. Dishonesty against the background that you (Mr Elvey) have deliberately continued to rob the poor banana and plantain farmers of good governance.” “Knowingly taking advantage of directors who even though have an email address, do not have ready access to the internet. You have continued to manipulate the board to the detriment of the organisation only for your selfish gain,” Henry claimed. The AIBGA was established in 1946 to promote, encourage, foster, develop and institute measures for the well-being of banana growers of Jamaica and to protect and advance their interests. It was to give growers an influential voice in the management of their industry. FARMERS’ MONTH CELEBRATIONS: Lenworth Fulton (2nd left), President of the Jamaica Agricultural Society (JAS), welcomes Champion Farmer 2018 Martin Zsifkovics to the launch of National Farmers’ Month, held at the JAS headquarters in downtown Kingston on April 3, 2019. Others from left are Hedda Pitter, Business Development Manager, Newport-Fersan, and Peter Thompson, Chief Executive Officer, Rural Agricultural Development Authority. This year is the 36th anniversary of Farmers Month, held annually to celebrate the work of Jamaican farmers. he Bernard Lodge Farmers Association has retained the services of law firm Knight, Junor and Samuels as it steps up its fight against the government's repossession of lands occupied by members of the association in St Catherine. This was revealed at a meeting of the farmers on Sunday. The Farmers' Association is now demanding the removal of the Chairman of the Bernard Lodge Master Plan Enterprise Team as a condition for further dialogue on the matter. The farmers have mounted a fierce campaign, complaining about the manner in which they are being evicted from the property, and the proposed site of their relocation. They had also threatened legal action if the issues were not resolved. Hugh Johnson, a spokesman for the group said that the farmers’ association will be joining with other groups in the fight for “justice”. “Understanding the issues at play, they have expressed their willingness, in teaming up with us, to ask the government to deal equitably with the farmers,” he said. Fisheries, Dr Trudi Stewart-Gaynor. Livestock specialist Dean Avril was offered a two-year contract as Chief Executive Officer of the Board. Shaun Baugh Principal Director at the Ministry of Industry, Commerce, Agriculture & Fisheries is on secondment to take up a post at Caricom. Mr Johnson said the farmers group would not have any further dialogue with the Bernard Lodge Master Plan Enterprise Team "until they would have apologised to us and with those derogatory statements made about the farmers..." The objectionable statements related to claims that the farmers were unable to pay for the lands which they had leased and which the government now wants to divest to private interests, he said. "We're asking the Prime Minister to remove this chairman (of the Enterprise Team), for us to have dialogue, or remove the minister, and if that fails, we'll even ask for further removals," he said. marked to continue rehabilitation and development of major rural farm roads $326 million will be spent to continue development of the Spring Gardens Agro Park to improve on-farm roads, rehabilitation of the existing packing house, and installation of pumping equipment, as well as river training structures to reduce flooding and soil erosion. Meanwhile, Dr. Clarke says $795 million will be allocated to facilitate works by Rural Water Supply Limited, to upgrade systems in several parishes. This will involve the rehabilitation of catchment tanks; and installation of guttering, storage and solar pumps in schools and public institutions. Retirees from the Ministry of Industry, Commerce, Agriculture and Fisheries who served for between six and 41 years as public servants pose with Acting Permanent Secretary, Dermon Spence (c) at the Ministry’s the Recognition Ceremony for Retirees held at the Knutsford Court Hotel on March 28, 2019 Minister of Ministry of Industry, Commerce, Agriculture and Fisheries, Audley Shaw (r) greets Deidre Latibeaudiere, Senior Director, Human Resource Management and Development (l) and Clovis Bryan retiree who served in the Ministry for 40 years to the Recognition Ceremony for Retirees held at the Knutsford Court Hotel on March 28.
tary with responsibility for at the Ministry of Finance and the Public Service, announced that with the new pension system to be launched soon, retirees could expect to receive their pensions within a month of their retirement. This would be made possible, Mr Jones said, under the Public Employees Pension Administration System (PEPAS), subject to the provision of accurate data for processing of the pensions. The deputy financial secretary encouraged the retirees to embark on activities to transfer their knowledge and experience and also to monetize their skills. abinet has received a submission from the Ministry of Industry, Commerce, Agriculture and Fisheries, seeking to reverse plans to sell the Agricultural Marketing Corporation (AMC) complex on Spanish Town Road in Kingston. Portfolio Minister Audley Shaw, who said the nine-acre property was put up for sale in January 2016, reiterated plans to transform the complex into a modern agroprocessing facility. The complex was previously used to package exports and process produce for local distribution. Shaw indicated that other agro-processing centres will be established across the island. SCJ Holdings diffuses tension with Bernard Lodge farmers BERNARD LODGE, ST. CATHERINE: CJ Holdings is seeking to diffuse tension with farmers occupying the Bernard Lodge lands in St. Catherine. Joseph Shoucair, the company's chairman, has admitted that inadequate notice was given to the farmers to relocate. However, Mr. Shoucair said they are getting a good deal. "We are meeting with them on a oneon-one basis now to say, 'Pay me for what I have or give me time to reap it' and in either event, we will agree. This week, the first batch of farmers, each person will receive a letter which will have attached to it a copy of the valuation of their holdings done by RADA and indicating the amount of compensation that will be payable," he said. The farmers have been complaining about the manner in which they are being evicted from the property, and the proposed site for their relocation. age member states to monitor and control the movement of agricultural commodities to safeguard their food security, consistent with the realities of World Trade Organization Sanitary and Phytosanitary Regimes. The expected outcome of this Market Access Mechanism are: • Assurance of stability in Jamaica’s agriculture and food production systems thereby creating greater access and opportunities to the Jamaican farmers. • Higher and broader participation in the decision-making process in respect to granting import permits, thus eliminating bias and encouraging the sourcing of locally-produced food before attempting to import. In the operation of government, one has to be conscious of the requirement to finance activities of this nature. It is for this reason that I propose that similar financing mechanisms allow for partial financing by the relevant application fees paid for imports permits. The Government should be asked to consider a bipartisan approach for the establishment of this broad-based oversight Market Access Council to grant permission for food imports and monitor such imports into Jamaica to be supported by a modern national agricultural market intelligence system and a local food production database. Caribbean MSME Conference: Minister of State in the Ministry of Industry, Commerce, Agriculture and Fisheries (MICAF), Hon. Floyd Green (right), in discussion with (from left) President, Small Business Association of Jamaica (SBAJ), Hugh Johnson; and Chairman of the 2019 Caribbean Micro, Small and Medium Enterprises (MSME) Conference, Dr. Blossom O’Mealy-Nelson, at the media launch of the Caribbean MSME Conference, at the Ministry’s New Kingston offices, on March 20, 2019. This year’s conference will be hosted by the Small Business Association of Jamaica in collaboration with Ministry’s MSME Division and will be held April 16-18, at The Jamaica Pegasus hotel, under the theme ‘Improving Sustainability Through Resource Development’. On his tour of the Hi-Pro booth at the Hague Agricultural show, Minister of Industry, Commerce, Agriculture and Fisheries, Audley Shaw prepares to sample his gourmet egg treat as Hi-Pro’s Assistant Vice President Jaime Ogilvie looks on. Growth Inducement Programme: Minister of Industry, Commerce, Agriculture and Fisheries, Audley Shaw (r), greets Chief Executive Officer, Corporate Strategies Limited, Senator Aubyn Hill (left), at the Planning Institute of Jamaica’s (PIOJ) Inaugural Economic Growth Forum at the Terra Nova AllSuites Hotel, on March 14, 2019. Others (from left) are Minister of State in the Ministry of Foreign Affairs and Foreign Trade, Pearnel Charles Jr; and Member of Parliament for Central Manchester, Peter Bunting. The PIOJ Growth Inducement Programme hosted its Forum under the theme ‘From Elusive to Inclusive Growth’. Marina Young (second left), Principal Director of Technical Services at RADA and RADA Executive Secretary, Kay Grant join JAS President Lenworth Fulton and Hi-Pro Operations Manager, Tricia Jackson as they consider possibilities for the future of Queggs in the Jamaican market. Onion production: Minister of Industry, Commerce, Agriculture and Fisheries, Hon. Audley Shaw (left), listens keenly as Farm Operations Manager at Dencon Foods and Farm in Clarendon, Nicholas Duke (stooping), explains methods of onion production at the company, during a tour of the farm on March 21. Also on the tour (from second left) are Chief Executive Officer of the company, Hurshel Cyrus; Permanent Secretary in the Ministry, Dermon Spence, and Chairman of Dencon, Clive Blackwood. Hi-Pro Store Operations Manager, Tricia Jackson shares a jovial moment with Director of Sales & Marketing at Best Dressed Chicken, Michael Jones over their freshly-made Queggs. enablers of economic growth.” Gyles is eager to improve efficiency and increase productivity at the NIC and is a firm believer that automation is the answer. He has set a target to automate some manual processes within the NIC. The NIC has a robust energy efficiency programme that is near and dear to his heart, and the energy engineers are “kept on their toes” in implementing energy efficiency projects which have achieved significant cost savings for the commission. He also believes in tooling employees, and as such, a group of technical and senior administrative staff were recently trained in project management. It is no doubt that leading a government company with over 270 workers is quite challenging. In response to how he manages and minimises stress, Gyles declares that he is a situational leader, “I lead as the situation warrants. So I have a mix/blend of all the styles of leadership, but I lead based on the situation. NIC needs that type of leadership.” He credits the guidance of the Board of Directors of the NIC and Chairman Senator Aubyn Hill on their excellent governance policy and direction that keep the Commission settled and focused on execution of the high-level strategies in keeping with Vision 2030 Jamaica. Gyles is a deacon at the Greater Portmore Open Bible Standard Church and serves the community as a Justice of the Peace. He spends his downtime with his wife Andrea and daughters JoAnn and Jaydene. He is an avid sports fan, and participates in company and community football, cricket games and competitions. The Ministry of Culture, Gender, Entertainment and Sport, in partnership with Hardware & Lumber Ltd donated over $1 million in redeemable gift cards to the residents of Accompong village, which can be used at any of the 10 H&L Rapid True Value or 5 H&L Agro locations. Present for the hand-over from left are: Simone Mahabeer, Marketing and Corporate Communications Manager, Hardware & Lumber Ltd; Olivia Grange, Minister of Culture, Gender, Entertainment and Sport; Hon JC Hutchinson, Minister without Portfolio in the Ministry of Industry, Commerce, Agriculture and Fisheries; and Olive Downer Walsh, Deputy CEO, Hardware & Lumber Ltd. Minister Grange said, “The Government wants all citizens to be able to take care of their families and do business. We are happy to see that Hardware & Lumber is also appreciative of this fact and their support will definitely go a far way in helping the residents to continue to grow their businesses.” The Economic Opportunities programme is a local networking and business development platform that helps residents by facilitating access to tools, resources and information for the residents. Olive Downer Walsh, Deputy CEO, Hardware & Lumber Ltd (r) presents grant to Poultry Farmer Shamora Lennon at the Economic Opportunities Workshop Grant Handover Ceremony at the Accompong Maroon Village, St. Elizabeth. Hardware & Lumber Ltd. was on hand to support the awarding of 50 grants to Accompong residents by the Ministry of Culture, Gender, Entertainment and Sport. Downer Walsh said, “The Accompong Maroon Village is an important part of Jamaica’s economic development and also our culture as it represents the strength and resilience of our people. Supporting the MCGES and their economic opportunities programme with these gift cards was an easy decision for us and we will continue to look for other ways in which we can lend our support to Colonel Ferron and the Accompong Maroons.” In addition to the financial support from MCGES, the Accompong residents also received H&L loyalty cards to support their long term development. SLUGOFF Always exercise caution and wear proper safety gear when handling, preparing and using fungicide; keep out of reach of children. Refer to Product Instructions for correct usage. Available at Hi-Pro Farm Supplies, Pharmacies, Supermarkets, Hardwares and Wholesales islandwide. An effective molluscicide that controls snails and slugs in Banana, Plantain, Citrus, Coffee, Cocoa, Papaya, Corn, Cabbage, Carrot, Cauliflower, Strawberry, Pea, Beans, Peppers, Tomato, Lettuce, Melon, Cucumber, Watermelon, Onions, Garlic, Escallion, Ornamentals, Sugar cane, Turf, Lawns, Pasture and Forage. Farmers to Learn about Climate-Smart Agricultural Practices By Chris Patterson ome 5,000 farmers from the parishes of St. Thomas, St. Mary and Portland are to benefit from a €400,000 (J$5.6-million) project, aimed at increasing their capacity to implement climate-smart agricultural practices. Dubbed, ‘Accelerating the Uptake of Climate-smart Agriculture in Jamaica’, the project is to strengthen the resilience to climate extremes and improve agricultural productivity and incomes of smallholder farmers in Jamaica through the promotion of widespread adoption of climate-smart agriculture (CSA) practices that are most aligned with national policy priorities. The project is being funded by the Technical Centre for Agriculture and Rural Cooperation (CTA), based in the Netherlands. Some 5,000 farmers from the parishes of St. Thomas, St. Mary and Portland are to benefit from a €400,000 (J$5.6-million) project, aimed at increasing their capacity to implement climate-smart agricultural practices. Dubbed, ‘Accelerating the Uptake of Climate-smart Agriculture in Jamaica’, the project is to strengthen the resilience to climate extremes and improve agricultural productivity and incomes of smallholder farmers in Jamaica through the promotion of widespread adoption of climate-smart agriculture (CSA) practices that are most aligned with national policy priorities. The project is being funded by the Technical Centre for Agriculture and Rural Cooperation (CTA), based in the Netherlands. Chief Executive Officer, Rural Agricultural Development Authority (RADA), Peter Thompson said increased adoption of climate-smart agricultural practices in those parishes is critical and will guide farmers in using best practices for farming. Sharing happy moments at the Breakfast Meeting and partnership signing on February 28, 2019 and Spanish Court Hotel, New Kingston are Valerie Veira, Chief Executive Officer, Jamaica Business Development and Peter Thompson, Chief Executive Officer, Rural Agricultural Development Authority. •Do not try to kill every single pest, most crops bear well even with some pest damage. Principles of IPM 1. Understand the crop, its environment and how they interact 2. Many disciplines are involved 3. Natural techniques are maximized 4. Pesticides are a last resort Impact of IPM Increased crop yield and quality Reduced losses to pests Reduced health risks Improved environmental quality and food safety 5. Improved farmer earnings 1. 2. 3. 4.
two more enduring reasons for the slowdown: The growth rate of world population peaked in the late 1960s at 2 percent a year and slowed thereafter. A rising proportion of the world's population had reached fairly high levels of food consumption, so the scope for further increase was limited. By 1997-99, 61 percent of the world's population were living in countries where average food consumption per person was above 2 700 kcal per day. Demand for agricultural products will continue to grow more slowly These factors will continue to influence trends in demand over the next three decades. For example, world population will go on rising, but less rapidly, growing at an average of 1.1 percent a year up to 2030, compared with 1.7 percent a year over the past 30 years. By 1997-99, 61 percent of the world's population were living in countries where average food consumption per person was above 2 700 kcal per day. world agricultural demand? This is not expected, because India's cultural traditions favour vegetarianism, which will hold back the country's demand for meat and animal feeds at rates well below those seen in China. Traditionally, the developing countries as a whole have had a net surplus in agricultural trade. In value terms this peaked at US$17.5 billion in 1977. The trend since then has been for their imports to grow faster than their exports. The agricultural trade balance of the developing countries has gradually dwindled until, by the mid-1990s, it was more often negative than positive. The highest recorded deficit was US$6 billion, in 1996. This overall trend masks a complex picture which varies from one commodity to another and from one country to another. The drastic decline in developing countries' net surplus in sugar, oilseeds and vegetable oils, for example, reflects growing consumption and imports in several developing countries and the effects of protectionist policies in the major industrial countries. For commodities produced almost entirely in developing countries and consumed predominantly in the industrial countries, such as coffee and cocoa, slow growth in demand prevented the trade balance of the developing countries from improving. Fluctuating and, on balance, declining prices further contributed to the problem. The projections to 2030 show the agricultural trade deficit of developing countries growing still further. Monsanto to pay cancer patient $80M SAN FRANCISCO, USA: U.S. jury on Wednesday awarded $80 million in damages to a California man who blamed Roundup weed killer for his cancer, in a case that his attorneys say could help determine the fate of hundreds of similar lawsuits. The six-person jury in San Francisco returned its verdict in favor of Edwin Hardeman, 70, who said he used Roundup products to treat poison oak, overgrowth and weeds on his San Francisco Bay Area property for years. The same jury previously found that Roundup was a substantial factor in Hardeman's non-Hodgkin's lymphoma. Agribusiness giant Monsanto says studies have established that the active ingredient in its widely used weed killer, glyphosate, is safe. The company said it will appeal. "We are disappointed with the jury's decision, but this verdict does not change the weight of over four decades of extensive science and the conclusions of regulators worldwide that support the safety of our glyphosate-based herbicides and that they are not carcinogenic," according to a statement from Bayer, which acquired Monsanto last year. A different jury in August awarded another man $289 million, but a judge later slashed it to $78 million. Monsanto has appealed. Hardeman's trial may be more significant than that case. U.S. Judge Vince Chhabria is overseeing hundreds of Roundup lawsuits and has deemed Hardeman's case and two others "bellwether trials." The outcome of such cases can help attorneys decide whether to keep fighting similar lawsuits or settle them. Legal experts said verdicts in favor of Hardeman and the other test plaintiffs would give their attorneys a strong bargaining position in any settlement talks for the remaining cases before Chhabria. Many government regulators have rejected a link between cancer and glyphosate. Monsanto has vehemently denied such a connection, saying hundreds of studies have established that the chemical is safe. Monsanto developed glyphosate in the 1970s, and the weed killer is now sold in more than 160 countries and widely used in the U.S. The herbicide came under increasing scrutiny after the France-based International Agency for Research on Cancer, which is part of the World Health Organization, classified it as a "probable human carcinogen" in 2015. Lawsuits against Monsanto followed, and thousands are now pending nationwide. Monsanto has attacked the international research agency's opinion as an outlier. The U.S. Environmental Protection Agency says glyphosate is safe for people when used in accordance with label directions. NOTICE ALL UNREGISTERED COFFEE FARMERS • Are you a Coffee Farmer? • Have you BEEN REGISTERED with the Jamaica Agricultural Commodities Regulatory Authority (JACRA)? • You are not sure? Please contact the JACRA Head Office: At 876- 536-1706/ 876-536-1740/876-758-3903 Mondays to Fridays between 8:30 am and 4:00 pm In order to verify your registration status. he Honourable Minister of Industry, Commerce, Agriculture and Fisheries has declared, by Order, a Close Season for queen conch (Genus Strombus) for the period March 1, 2019 to January 31, 2020. For the first 21 days of the close season (that is March 1, 2019 to March 21, 2019), only conch meats which have been inspected and verified by the Fisheries Division via a Certificate of Conch in storage in 2018 and conch opercula may be sold, processed or imported. Accompong targeted for Hemp pilot By Okoye Henry, JIS: inister without Portfolio in the Ministry of Industry, Commerce, Agriculture and Fisheries, J.C. Hutchinson, says there are plans for a hemp cultivation pilot project in the Maroon community of Accompong, St Elizabeth. Hutchinson indicated that the Ministry is looking to cultivate 50 acres of the plant for use as raw material in a variety of commercial products, including oils and animal feed. The proposed venture will complement the Alternative Development Programme (ADP) that was implemented in Accompong and other communities earlier this month, to provide small-scale farmers with a channel through which to benefit from the cannabis (ganja) industry. “We are going to start in the Big Ground area of Accompong, and once we get that going, we are going to [cultivate all] of it with hemp. Accompong has a lot of land and we want to put everybody to work,” he said. Hutchinson was speaking at the Ministry of Culture, Gender, Entertainment and Sport ‘Economic Opportunities Workshop’ Grant Handover Ceremony, which was held in the community on March 22. JAMAICA LICENSED CANNABIS OPERATORS MEET MINISTER SHAW: Minister of Industry, Commerce, Agriculture and Fisheries, Audley Shaw (3rd left), along with (from left) Group General Manager, Kaya Inc., Kurt Reid; President, Jamaica Licensed Cannabis Association (JLCA), Hardley Lewin; President, Itopia Life Limited, Joan E. Webley; Chief Executive Officer, Everything Oily Labs Limited, Rory Lui; Managing Director, Jamaica Red Meen Limited, James Morton; and Chief Executive Officer, Sun Spice Seasonings Company Limited, Maurice Ellis, during a courtesy call on April 11, 2019. Minister Shaw met with the Jamaica Licensed Cannabis Association to discuss matters relating to the medical cannabis industry. industry are important in satisfying the requirements of the United Nations (UN) drug conventions, to which Jamaica is a signatory. “As a part of our obligation to these conventions, the regulations of the CLA address the handling of ganja for medicinal purposes, which include its transportation, processing, importation and exportation,” she pointed out. ‘ECO-BASED ADAPTATION STRATEGIES: Omar Hanson (left) of Manchester 4-H Clubs, explains operation of hydroponic system on display to (from left) Audley Shaw, Minister of Industry, Commerce, Agriculture and Fisheries, Ackera Gowie, National 4-H Girl 2012 and National Festival Queen 2018, and Hidran McKulskie, Chairman, Jamaica 4-H Clubs. The occasion was the Jamaica 4-H Clubs National Achievement Day Expo held at Denbigh Showground in Clarendon on April 5, 2019. In keeping with the theme ‘Eco-based Adaptation Strategies: A 4-H Response to Climate Smart Agriculture’, Minister Shaw underscored the importance of practising climate smart agriculture and stated that the irrigation systems in Clarendon and St. Catherine are to be expanded. In the background (from left) are Garfield Ewart, Field Services Director, and Ronald Blake, Executive Director, both of the Jamaica 4-H Clubs. NATIONAL 4-H BOY AND GIRL OF THE YEAR: Industry, Commerce, Agriculture and Fisheries Minister, Hon. Audley Shaw (right), converses with 2018 National 4-H Boy of the Year, Sandray Miller (left), and Girl of the Year, Imani Smith, during the Jamaica 4-H Clubs National Achievement Expo, at the Denbigh Agricultural Showground in May Pen, Clarendon, on April 5. ONION FIELD DAY: Farmers in Llandewey, St. Thomas and extension officers pose for a photo at a recent Onion Field Day staged by the technical staff of Ag Chem Plant Limited in keeping with the company’s ongoing farmers’ training prgramme. What to do! If you feel you have Dengue Fever: ✓ Visit your health centre or doctor and follow instructions given carefully ✓ Rest ✓ Drink a lot of fluids ✓ Use Paracetamol pain killers ONLY ✓ DO NOT TAKE other pain killer, such as Aspirin, Ibuprofen and other anti-inflammatory drugs, as they may increase your risk of bleeding. ✓ Cover it ✓ Keep it dry ✓ Clean regularly ✓ Fill it with soil or sand ✓ Punch holes in it ✓ Recycle or dispose ✓ Avoid being bitten by mosquitoes ✓ Use insect repellent containing DEET, IR3535 or PICARIDIN ✓ Use mosquito nets ✓ Use mosquito destroyer ✓ Put screens on window and door ✓ holes in it ✓ or dispose ✓ Take community actions Community members must work together to prevent Aedes breeding in their community. NUTRITION The importance of water 5. It helps maximize physical performance - Drinking plenty of water during physical activity is essential. Athletes may perspire up to 6 to 10 percent of body weight during physical activity. Hydration also affects your strength, power, and endurance. You may be more susceptible to the effects of dehydration if you’re participating in endurance training or high-intensity sports such as basketball. he water in our bodies is essential for life. Without water, we can’t survive. Since the water in our bodies is continually being used or lost, it needs to be continually replaced, and the best fluid to replace it with is water. 1. It helps create saliva - Water is a main component of saliva. Saliva also includes small amounts of electrolytes, mucus, and enzymes. It’s essential for breaking down solid food and keeping your mouth healthy. Your body generally produces enough saliva with regular fluid intake. However, your saliva production may decrease as a result of age or certain medications or therapies. If your mouth is drier than usual and increasing your water intake isn’t helping, see your doctor. 2. It regulates your body temperature Staying hydrated is crucial to maintaining your body temperature. Your body loses water through sweat during physical activity and in hot environments. Your sweat keeps your body cool, but your body temperature will rise if you don’t replenish the water you lose. That’s because your body loses electrolytes and plasma when it’s dehydrated. If you’re sweating more than usual, make sure you drink plenty of water to avoid dehydration. more efficiently and helps to prevent kidney stones. 6. It helps prevent constipation- Eating fiber isn’t the only way to prevent constipation. It’s also important to maintain your water intake so your bowel movements contain enough water. If you don’t consume enough water, magnesium, and fiber, you may be more likely to experience constipation. If you’re already constipated, you may find that drinking carbonated water as well as plain water can help ease your symptoms. 3. It protects your tissues, spinal cord, and joints - Water consumption helps lubricate and cushion your joints, spinal cord, and tissues. This will help you enjoy physical activity and lessen discomfort caused by conditions like arthritis.